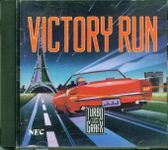 Victory Run recreates the thrill of the rugged Paris to Dakar road rally. Negotiate the unpredictable French countryside. Conquer the Sahara. Change gears. Increase engine speed. Replace damaged parts. The perfect union of man and machine, Victory Run matches physical strength with intelligence for the most challenging road race ever.